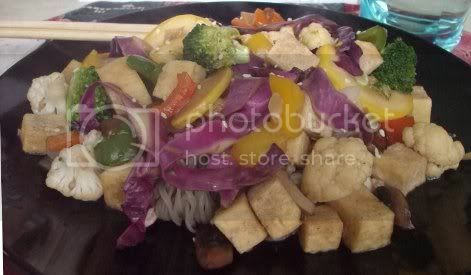 There’s a rather delicious basic stir fry recipe in The Clueless Vegetarian that I go to whenever I want to make a stir fry. The sauce is quick and easy, and it can be adapted to include whatever veggies and plant-based protein sources I happen to have on hand. Given the abundance of veggies coming into both the grocery store and the farm stand, I couldn’t resist pulling it out again for a “use every veggie in the fridge”-style dinner. I wanted a slightly different sauce this time, though, so I dug up the recipe for szechuan sauce from Vegan Fire & Spice . It doesn’t make enough sauce for a whole stir fry, but the recipe was easy enough to work with combine with the basic stir fry sauce from the other recipe. The result? 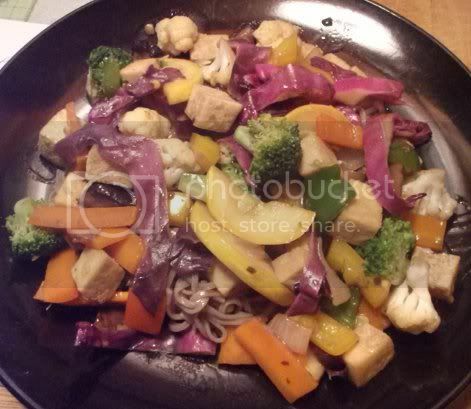 Szechuan stir fry with a rainbow of awesome veggies! I’ve listed what I used in my stir fry, but you can use whatever veggies you have around for this. Just make sure to toss in as many colors as possible for a yummy seasonal dish. 1) In a small bowl, blend the vegetable broth, soy sauce, and cornstarch. Set aside. 2) Heat the vegetable oil in a large saute pan over medium-high heat. 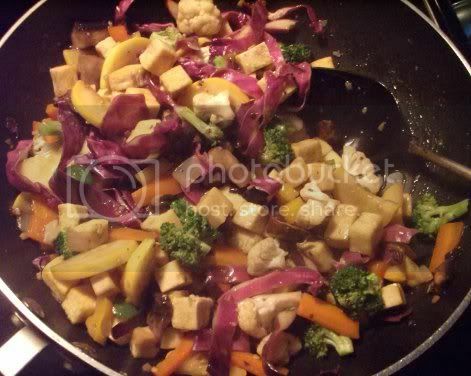 Add the tofu cubes and stir-fry until browned on all sides, 10-12 minutes. Remove from the pan and set aside. 3) In the same pan, heat the sesame oil over medium-high heat. Add the garlic, ginger, scallions, and hot pepper flakes and cook, stirring, for about 30 seconds. Add the onion and cook for a couple of minutes until it begins to soften. 4) Continue adding veggies in approximately this order, stir-frying for a minute or two after each addition: carrots and cauliflower, peppers and broccoli, yellow squash, mushrooms, and red cabbage. 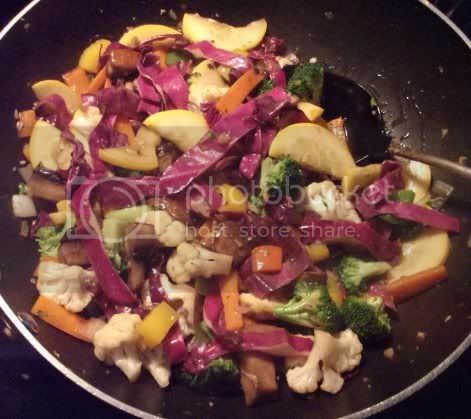 Continue to stir-fry until all veggies are tender and the cabbage turns bright purple. 5) Add the sauce to the pan and cook, stirring, until it begins to thicken. 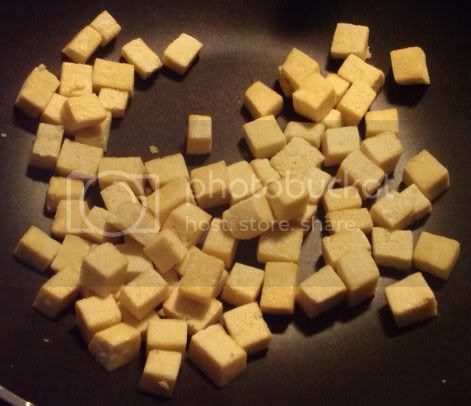 Remove from heat, add reserved tofu, and toss to coat. Serve immediately over rice or noodles.